What are the operational advantages of Plastic bulk containers (pallet boxes)? They are perfect for automated packaging and storage systems. What are the financial implications of switching to Plastic bulk containers (pallet boxes)? The initial cost of Plastic bulk containers (pallet boxes) is higher than the traditional wooden intermediate bulk containers. Over a period of time the Plastic bulk containers (pallet boxes) become far more cost effective. The cost per usage time of Plastic bulk containers (pallet boxes) is significantly lower. The life span of a Plastic bulk containers (pallet boxes) is much longer (up to 20 times more) and therefore the per usage time cost is much lower than the wooden intermediate bulk containers. What makes the Plastic bulk containers (pallet boxes) more cost effective? What makes the Plastic bulk containers (pallet boxes) last longer than a wooden container? Wood is affected by bacteria, fungus or insect contamination where plastic is not. 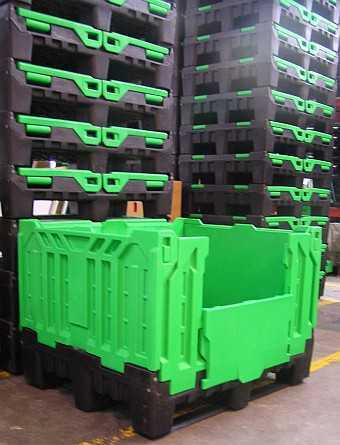 Plastic bulk containers (pallet boxes) are moulded with strong material – no weak spots in the craftsmanship. Freezing temperatures have no influence on Plastic bulk containers (pallet boxes) where wood becomes brittle and collapses or breaks easily. When stored outside in sun, rain and frost wood intermediate bulk containers rot in a short time. The wood in wooden intermediate bulk containers can be used for fires or construction and makes them far more likely to be stolen than Plastic bulk containers (pallet boxes). Are the Plastic bulk containers (pallet boxes) resistant to chemicals? Plastic bulk containers (pallet boxes) are moulded from High Density Polyethylene (HDPE). This material has excellent chemical resistance and is virtually inert to all alkalis, acids, solvents and detergents. Up to what temperature can the Plastic bulk containers (pallet boxes) structural foam containers withstand? What is the difference between static and dynamic? Static means the containers are not in motion (sitting on floor, in a supported rack, or stacked). Dynamic means the containers are loaded and in motion (being moved by a forklift or on a truck). How can I find the most suitable Plastic bulk containers (pallet boxes) for my storage and shipping needs? How can I get detailed information on Plastic bulk containers (pallet boxes)? Once you have listed your Plastic bulk containers (pallet boxes), you can click each image or product name to get details on that product. The details are displayed in another window, so you still keep the product list in view at the same time. Every time you click a product, the details window will pop up in front and show you the product’s details. Choose “Plastic Bulk Container Range” from the menu or use the product search box in the footer. Add the desired products to your order, enter the quantity of each product that you want to buy, add your contact and usage details and send us a request for quotation. How do I contact you with questions not related to any plastic pallets, crates or intermediate bulk containers? Choose “Contact us” from the menu, enter your details and click “Send”. You will see a confirmation page and receive a confirmation message by email.